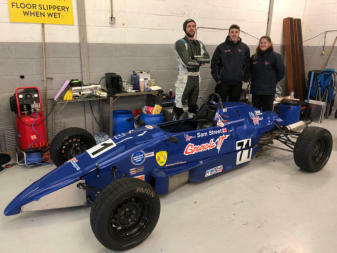 Car 71 - SwiftCooper SC92F - Formula Ford 1600 (1992) Classic pre 1993 class Sam Street - Driver and Lead Engineer Tim Street - Principle - Finance - Logistics - Truck Driver - Cook and Dad Jed Stott - Race Day Technician - Pit Board and Assembly Manager Kirsten Bolt - Technician (Sat/Sun) Harry Hopes - Technician (Sat/Sun) Ian Stott - PR - Media and Emergency Engineer Good testing sessions on Thursday and Friday in mixed weather conditions which was to prove ideal for the weekend ahead. 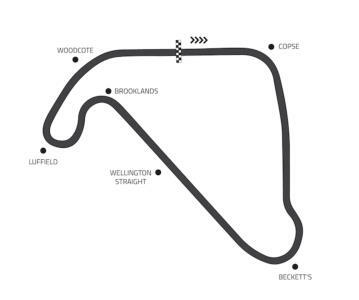 Times continued to improve after the car was reset after the Brands Hatch Festival 2 weeks before, understeer was dialled out pretty quick and fresh tyres on Friday also assisted with further reductions on times in sector 2 especially. 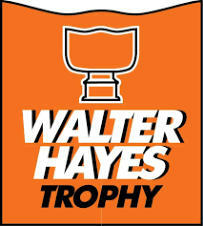 So the Walter Hayes Trophy 2019 was ready to go, driving a 26 year old car against bigger teams and more experienced drivers meant our objective was to get through to the semi-finals and see what happened from there on in. 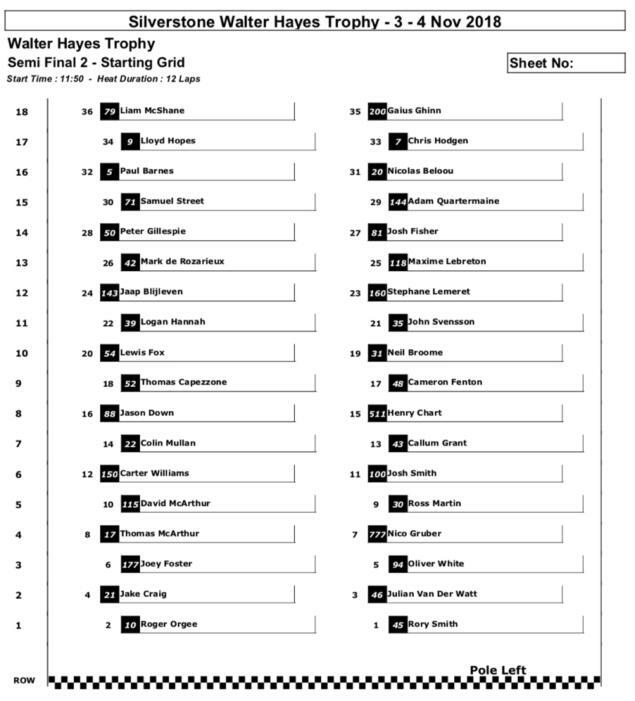 Sam was drawn in heat 5 of 6 with each grid being made up of 16-17 cars (circa 100 in total). 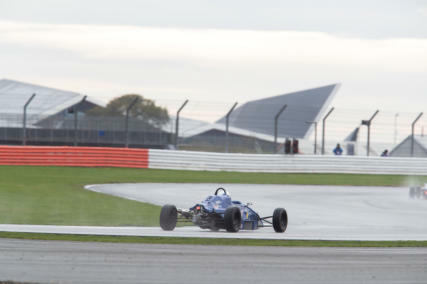 Qualifying in bright but damp conditions was a little tricky at times, Sam returned the car to parc ferme in 8 th . 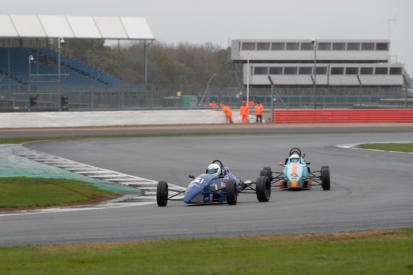 Racing from grid position 8 with the top 9 to qualify for the semi-final all we needed was for a clean uneventful race. 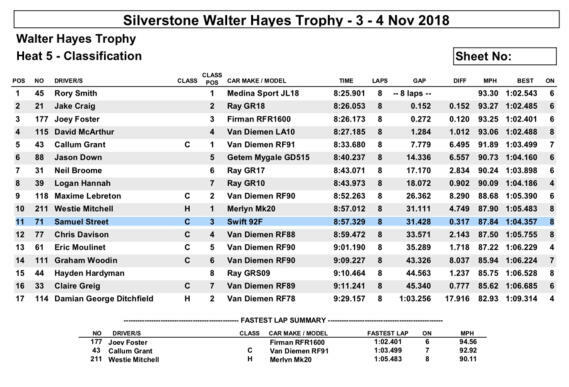 Sam launched well moving up 2 places on lap 1 sadly, Sam was compromised by another car’s early breaking on lap 2 of the race which dropped him to 15 th with only 4 laps remaining. A valiant recovery got him back up to 11 th but that wasn’t enough. It was however, enough to avoid the progression race on Sunday morning at 09:00. 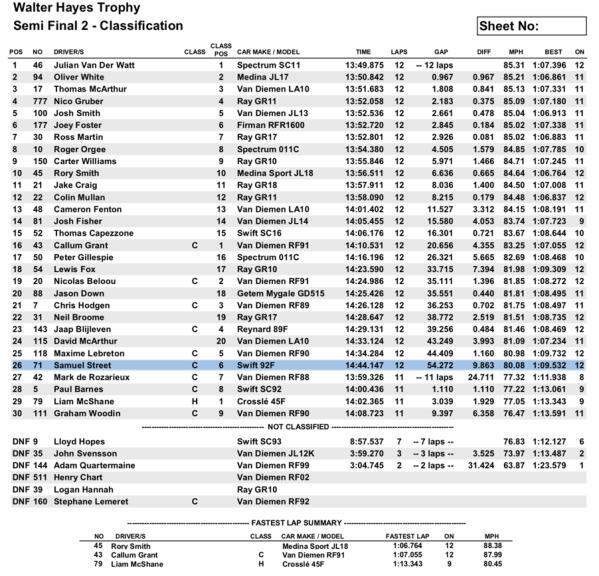 Here are the stats: The event has a series of catch all races the first being the progression race on Sunday Morning for anyone who has either not finished their heat or finished at the back of the pack. 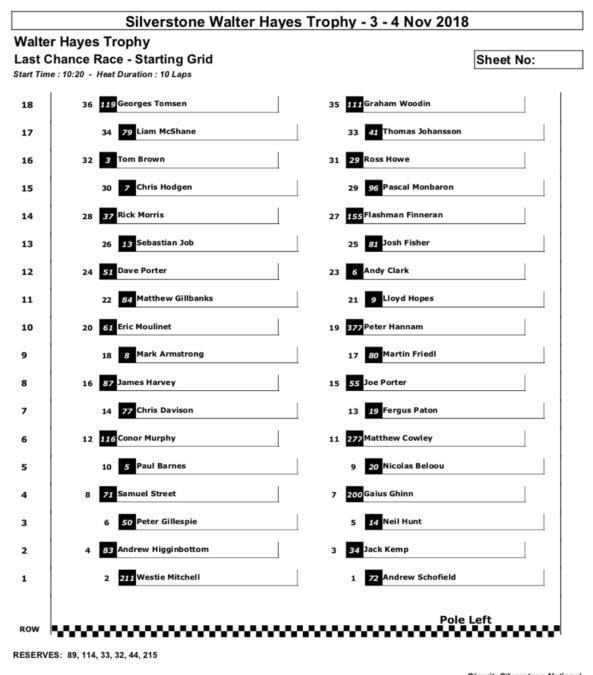 The first 18 from that race join the 18 from the 6 heats who finished 11 th , 12 th and 13 th in what is known as the “last Chance Race”. 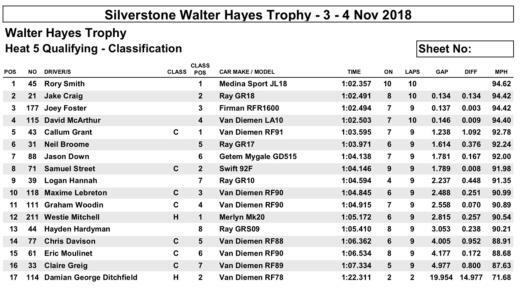 Sam was placed towards the front of the grid on Sunday at 11:10 as he finished 11 th as shown in the finishing sheet below. 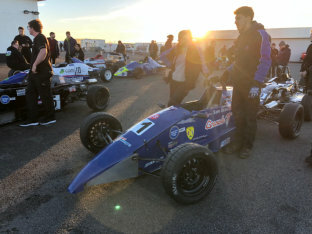 The last chance grid was full with 36 cars, all desperate to make the semi-finals and with luck progress to the final. 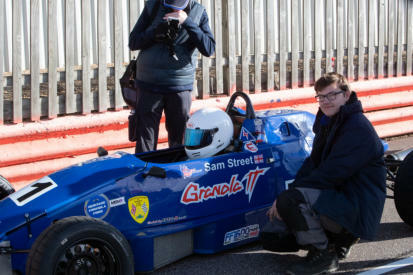 The grid was as follows: Arguably one of the best races Sam has ever driven in his FF1600 SwiftCooper SC92F. Setting good times consistently and finishing 1.5 seconds clear of 7 th place in 6 th . 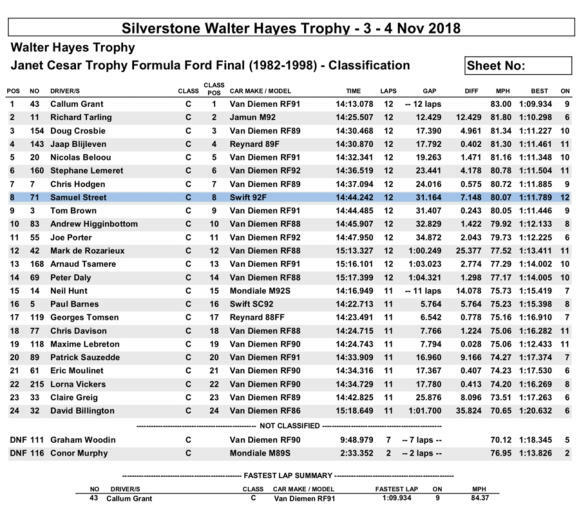 Notably a Class win as well on the pit wall everyone was really pleased at the result which was definitely moving ahead of expectations for the weekend. 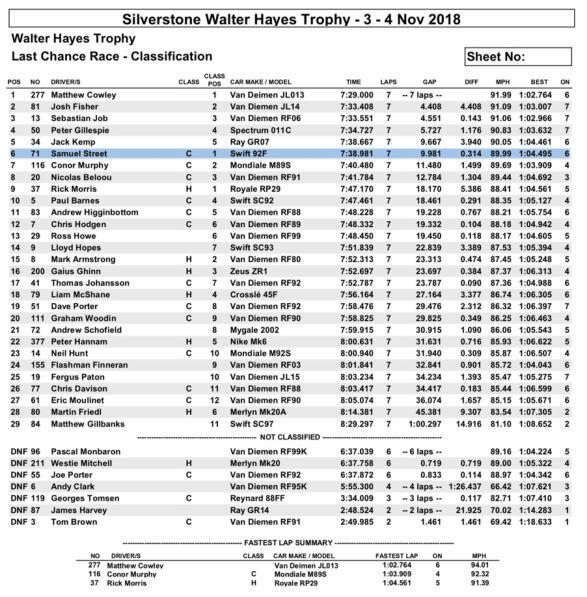 The result being 6 th would give us our first chance at a semi-final at the Walter Hayes and with the performance he had through the weekend a hope of a place in the final. The semi-finals provided quite a lot of concern with the weather being very changeable as such selecting the right set up would make or break the day for many. 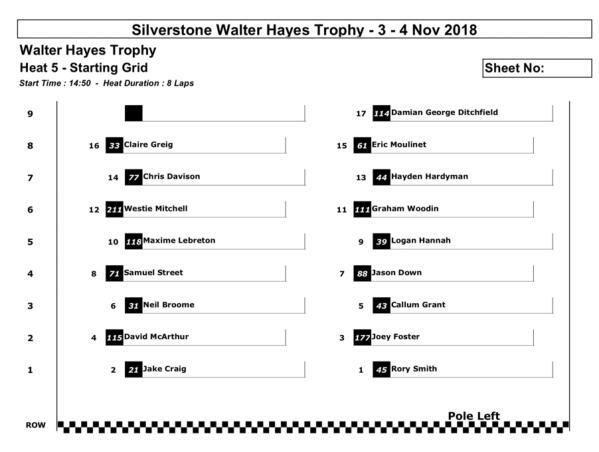 #71 placed 30 th on the grid hopeful of progressing to 18 th to make the final. 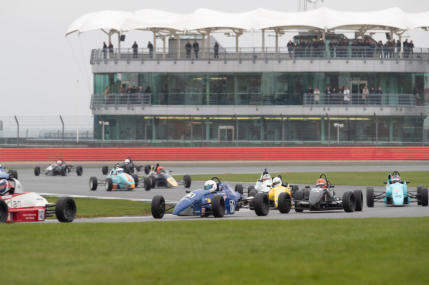 The 2 nd semi-final lived up to its expectations as being hard fought and full of incidents, Sam benefitting initially from a collision that saw several cars spin on lap 1 with #71 moving up to 22 nd and on pace to go further. Lap 2 saw Sam involved in his first collision and spinning out and down to 28 th still 2 places up from his starting position but a long way off the targeted 18 th . He recovered more places, but another incident left him finishing a gallant 26 th . Leaving just the Janet Cesar Classic (Pre-1993) trophy to compete later in the day. 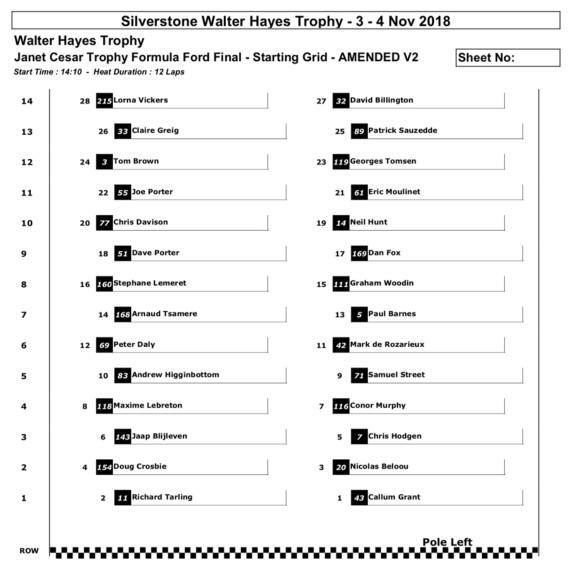 So, for our final race of the weekend the grid looked as follows: Another great start and a very competitive race was had by all with a lot less “animation” from the drivers, we were happy with the result and some very impressive times bringing the car home in 8 th again moving forwards from the grid start position when others ahead and behind had struggled to hold their position with faster cars coming through from behind. Reviews of the data will lead to more positive changes in the out of season time from now until April 2019. 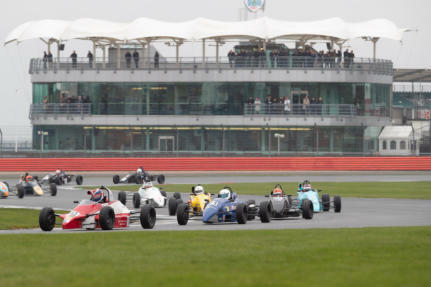 Following the events at Donnington, Brands Hatch and Silverstone we have a really positive feeling about racing in 2019. Many thanks to everyone who has assisted in no matter what capacity, big help or small you all know you are, and it’s really appreciated. 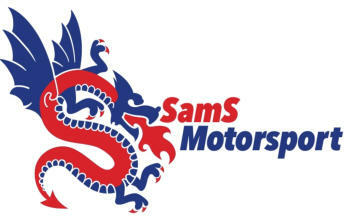 So here it is the final result sheet of 2018… what can Somerset’s driver achieve in 2019 watch the website and social media for loads more information.